Look at that lovely smile, those beautiful…curves, the sturdiness of her; Jeri Thompson looks like a chick who could drink a beeah or two and talk about teh futball then go home and make you yell. You can see why she’s my pick! 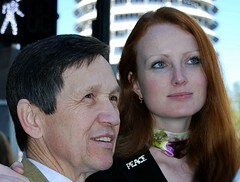 Sure, Elizabeth Kucinich is a redhead with porcelain skin who’s well fit. Courtney points out that she has a cute little English accent and a tongue ring, which I guess are kind of bonuses. Oh, and she’s younger than me. Lemme look at that third picture again. Sheeeeeeet, I think I changed my mind. Yeah, Mrs. K is smokin’ and Mrs. T looks a bit frumpled in comparison. Batshit’s wife wins! ~ by kinshay on 2008-01-03.
do you think thompson nick-named her breasts law and order? hey yo! order the veal! 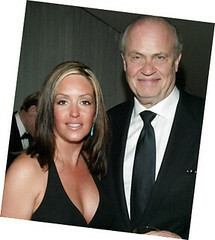 fred thompson has dropped out. frankly, i thought his performance was poor at best. goodnight jeri thompson, we hardly got to view you. This entry was posted on 2008-01-03 at 17:11 and is filed under Uncategorized.You can follow any responses to this entry through the RSS 2.0 feed.Both comments and pings are currently closed.